Happy New Year, welcome 2016! 2016 has arrived and it is now time to officially welcome it. 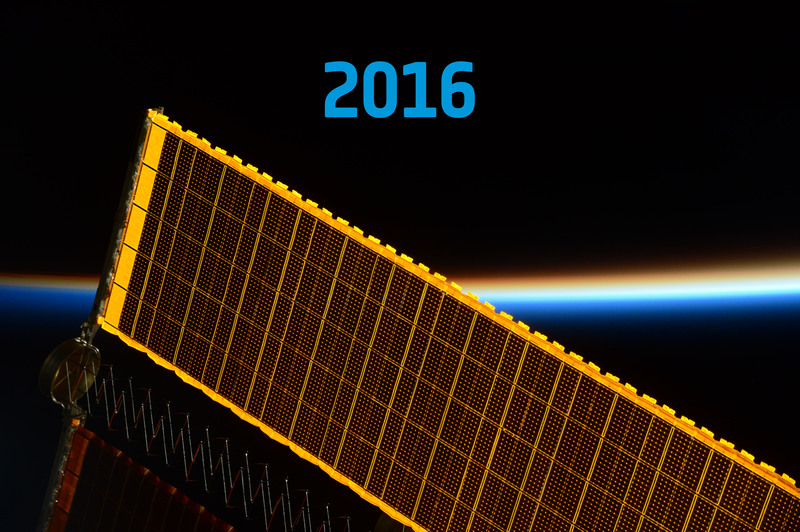 2016 will be a year of multiple facets, bringing new challenges and perspectives in many fields, including space. For ESA as an institution, the Council at ministerial level in December is coming closer and closer. It is no longer at the “end of next year”, but is now only 11 months away. The preparation has already started and will culminate soon. It is not only a matter of listing the ideas of the ESA Executive on space but also collecting proposals and expectations from a range of very different sources: Member States (national space agencies, national delegations and politicians), industry and the general public. All of this will be evaluated and fed into the “Director General’s proposal”. Sunrise strikes the solar panels that power the International Space Station ISS, caught by ESA astronaut Tim Peake on 31 December 2015. Credit: ESA/NASA. interesting concrete proposals pointing the way to the future. An evaluation of the interests of our Member States clearly indicates that we must carefully examine all the different areas and decide in which cases European autonomy would be the best way forward or where a cooperative effort would be more appropriate. If Europe wants to remain a reliable, sought-after partner for international cooperation it has to prove its abilities through demanding and ambitious activities. Merely to follow will not be enough. In this sense, and taking into account the diversity of Europe and ESA, as well as the budget available for space activities, finding the right balance and the right activities is a very challenging task. While such space-related matters are, of course, at the centre of our thoughts just now, we must also not lose sight of other important issues such as migration and its effect on Europe’s development. Robert Cullen, practicing for the Spine Race. Image credit: R. Cullen. I am also very happy and proud to see ESA colleagues not just content to sit back and observe but making a difference, taking steps to counterbalance our individualistic consumer society. One such example is Robert Cullen, an Earth observation scientist currently employed as a system and payload manager in the Copernicus programme at ESA’s ESTEC centre in the Netherlands, who has organised a charity fundraising activity. From 9 January of this year he will be taking part in the Spine Race, otherwise known as “Britain’s most brutal race”. 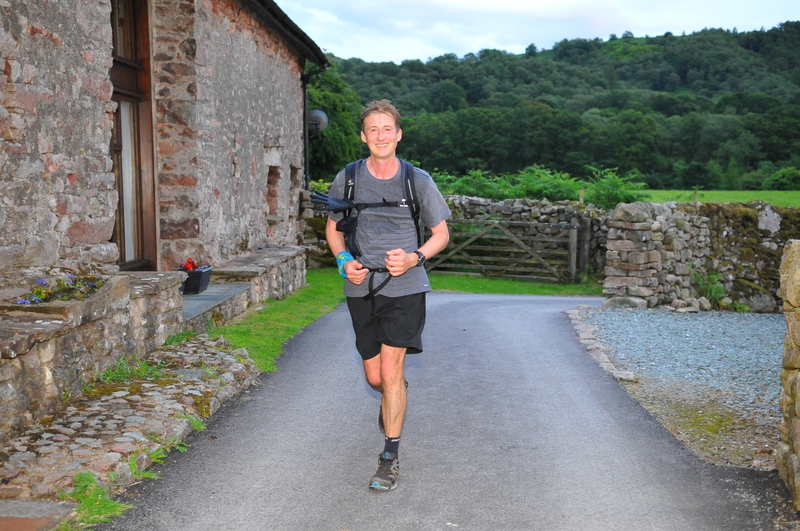 It is a nonstop, 431-km race across the Pennine hills from northern England into Scotland with challenges including 16 hours of darkness and the harsh British winter. The race typically takes between 5 and 7 days. Robert qualified to take part early last year and has been training hard ever since. His chosen charity is the Great Ormond Street Hospital, a world-leading children’s hospital focused on tackling childhood illnesses by means notably of research and innovation, treatment of medical conditions, patient and family support and equipment development. Read more on the ESA UK pages. After learning about this very special effort on top of his professional duties, I can only say “bravo” and “good luck”! I was delighted to read that you have plans for a Moon village, Jan, where nations can collaborate to develop resources and work towards self-sufficiency. This is the basis for the colony at the Moon’s south pole described in ‘Mother Moon’ which was recently published. I believe it makes a strong case for a permanent international base there. May I send a copy with my compliments for your consideration? Perhaps you would let me know where to send it to? In the process of “collecting proposals and expectations” and also from “the general public” I hope that someone has suggested that building an “artificial Moon” might be a more realistic mission than a moon base. An artificial Moon could be spherical and very large, so that shielding from radiation would make the artificial Moon a good place to live. Every mission could include more pieces to add to the new Moon. The advantage is that getting to the new Moon would be much, much easier than going to the old Moon. The new Moon could pay for itself because it could carry a vast array of TV and Internet services for Earth. The new Moon would be much safer to reach and return from, similar to the space station. I was delighted to read that you have plans for a Moon village, Jan, where nations can collaborate to develop resources and work towards self-sufficiency.